Several City Council members said Wednesday that further engagement with the community is necessary to strengthen public trust in the San Diego Police Department — part of the fallout from fatal shootings of unarmed black men in Ferguson, Mo., and New York City. The comments at a meeting of the council’s Public Safety and Livable Neighborhoods Committee were in response to a list of demands from a group that conducted a mostly silent protest at the city’s inauguration ceremony last month. Among other things, the Black Student Justice Coalition asked for reviews of police “abuses” and data collection, compiling annual reports of use of deadly force by officers, and strengthening the San Diego Citizens’ Review Board on Police Practices. 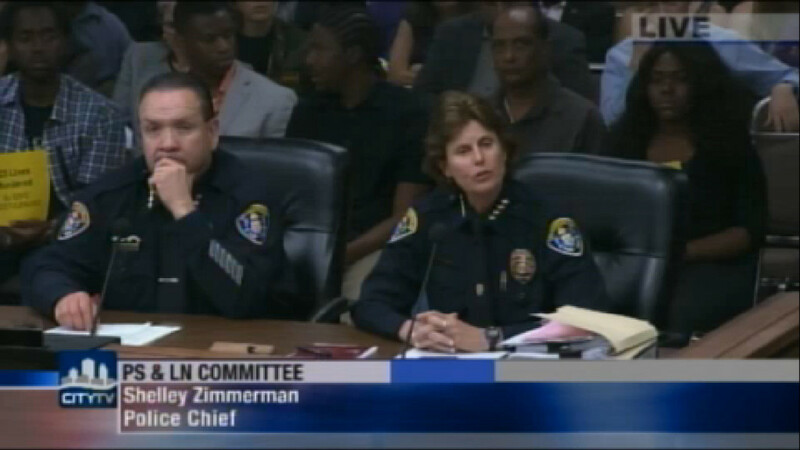 The demands were given to several council members and SDPD Chief Shelley Zimmerman. Mark Jones, the coalition’s leader in San Diego, said he has since met with them. “I see a considerable effort to reach out to the community, I see a considerable effort to, at the very least, try to work with us,” Jones told members of the committee. Jones, a Marine veteran, said the department needs to improve its cultural sensitivity training to reduce what he calls “institutional racism.” He said a recent discrimination lawsuit by a black SDPD sergeant over a racially offensive cartoon used during police training proved that race remains an issue. The SDPD chief said the department has good relations with all the communities in San Diego, but more has to be done. Councilwoman Myrtle Cole, who represents the historically black fourth district, said the discussion on the issue is just beginning. “I encourage further collaboration as we move toward bridging the gap between our police department and the community,” Cole said. She said San Diego can lead the nation in resolving the issue as it did in providing cameras worn on police officers’ uniforms — a device now being purchased by law enforcement agencies around the country.